Developed for people looking for new friends or potential dates, Badoo has quickly taken up residence among thousands of mobile devices and computer screens. The social dating site was founded by the Russian entrepreneur Andrey Andreev in 2006. Badoo is available in 47 different languages, and boasts over 200 million users worldwide, in more than 190 countries. 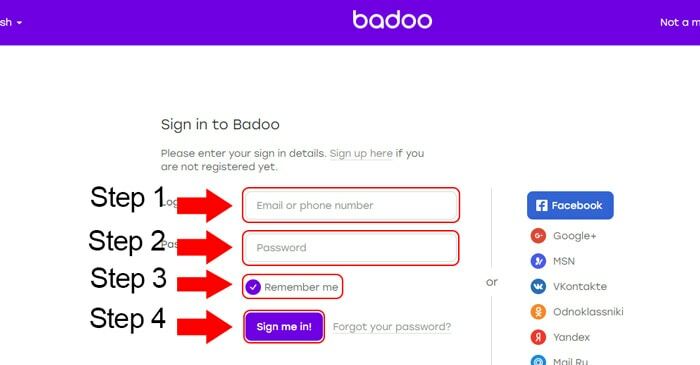 In this login guide, we’ll discuss the steps for signing into the Badoo login portal. The instructions in this section show you how to login to your Badoo account on a desktop browser. Using any web browser (Chrome, Firefox, Safari, or Internet Explorer) go to badoo.com. Click on the “Sign in” link. This can be found in the top right corner of the page. Once you do that, the Badoo login form will appear. Enter your email or phone number in the top field. Enter your password in the last field. Deactivate the “Remember me” function if you are signing in on a public computer. Click on the “Sign me in!” button to get to your account. In this section, we provide instructions for logging into the Badoo website on a mobile browser. Go to m.badoo.com (mobile -optimized website). Once the site has loaded, navigate to the login section. Input your email or mobile number in the top field. Tap the “Let’s go!” button to get to your account. Open the iTunes Store, and find the Badoo mobile application. Enter your email address/phone number in the top field. Tick the “Remember me” checkbox to make future visits more convenient. Tap “Sign me in!” to get to your account. Go to Google Play Store, and search for the Badoo dating application. Download the application, then open it. Input your email address/phone number in the first field. Check the “Remember me” box to make subsequent visits fast and easy. Tap “Sign me in!” to complete the login process. Go to the Badoo login page at badoo.com. Click on the “Sign in via Facebook” link. A pop-up window will appear asking you to sign into your Facebook account. Once you click on the button, you’ll be redirected to your Badoo account homepage. Note: You can also sign into your Badoo account using your Google+, VK, MSN, Odnoklassniki, or Yandex account. Users most commonly fail to login due to a forgotten password. If you don’t remember your password, here are the steps to reset it. 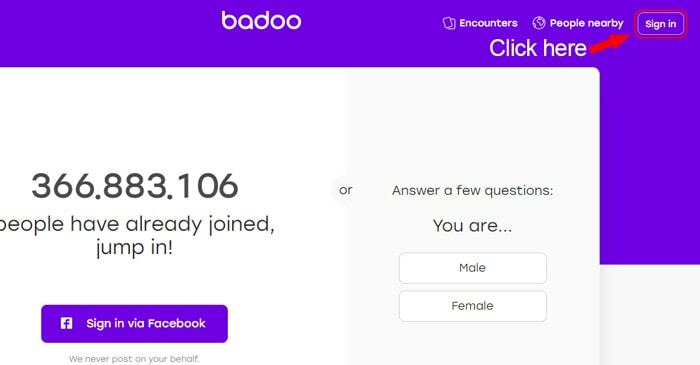 Go to the Badoo login page linked in the first section of this article. The password reset page will be displayed. Enter your email address/phone number in the provided field. You will receive an email with further instructions on how to create a new password. If you experience any other issues during the login process, visit the Badoo Help Center, where you can find information on a large variety of topics.